Ready to start the new year off by learning a new language? Maybe you are planning a trip? 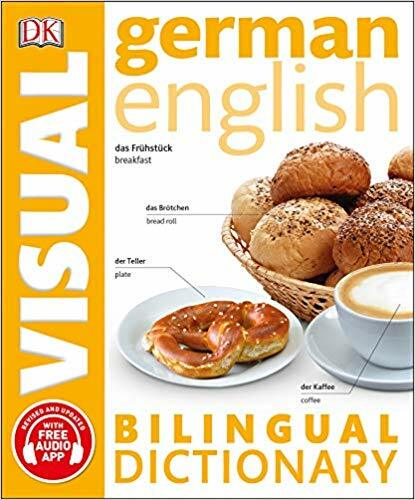 DK Canada has you covered with all of your language needs with their line of bilingual visual dictionaries. You may have made the decision to learn a new language for a variety of reasons. You may have planned the trip of a lifetime, you may want to challenge yourself or you may be trying to learn more about your own heritage. No matter what the reason, you have made an empowering, exciting decision in your life that should be celebrated. While exciting, it can be difficult to learn a new language. I remember as a child going to Italian classes and bringing my dictionary with me. The dictionary was old, contained no pictures, contained definitions and verbs that were far over my head. I constantly struggled to learn the language and the only thing I can now do at my age is write out – I am, he is, she is, they are. The brilliantly designed visual bilingual dictionaries take learning to a new level. The books can fit into the palm of your hand and would easily fit in a large pocket or your purse/backpack. Each page is full of pictures to go along with each word (which I feel would come in handy if you are travelling and mispronouncing a word!). Unlike your traditional dictionary which is alphabetical, the dictionary is broken down into main categories: people, home, services, shopping, food, work, transportation and so on. Each category is then further broken down into several pages with the most common words in that category. The book also comes with an index that can help you easily find the word and page you are looking for. I really liked the size and easy to follow style of this book. It encourages the learning process and gives you the support you need to not give up. The introduction contains helpful tools and learning activities that will help guide you through the learning process. The free audio app is a must, as it is one thing to read the words but listening to the tone and pronunciation in the native tongue will further your language skills. You can learn more about this series on the DK Canada Website and purchase a copy on Amazon.